Dr. Heap is a native Arizonan, growing up in Mesa. He received his DDS degree from the University of Colorado School of Dentistry after earning bachelors degrees in biology and medical sciences from Arizona State University and the University of Colorado. With a passion for continual improvement Dr. Heap is a member of many prestigious dental organizations, his favorite being the Crown Council – an organization dedicated to providing high-level dental care both here and in under-served areas of the world. As a firm believer in charitable service, he’s provided dental care to under-served communities in the United States, Brazil, Mexico, and Africa. Dr. Heap has also organized food drives for the needy and raised money for orphanages overseas. Dr. Heap has many hobbies and interests. He is a motivational speaker and recently became a best-selling author with his motivational book “The 3-Week Miracle.” Dr. Heap is also a sports fanatic who competes in cycling races throughout Arizona. He loves music and plays the mandolin with the Red Mountain Bluegrass Band. Dr. Heap is an amateur photographer and some of his recent pictures can be seen HERE. More than anything else, he enjoys spending quality time with his family. 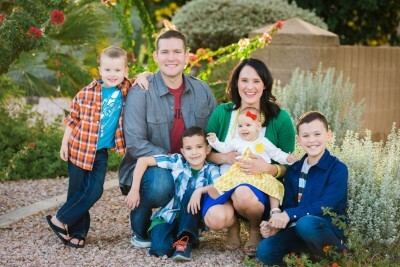 Dr. Heap and his wife, Sarah, are the proud parents of three sons and a beautiful young daughter.